The Boukoleon Palace is located in the Çatladıkapı neighborhood of the Fatih district. The 1,610-year-old Boukoleon Palace, is getting ready to take its place in the historical texture of Istanbul bit by bit. The palace was a Byzantine coastal palace built by Emperor Theodosius II (408-450 A.D.), with parts of it added during the time of Emperor Theophilos (829-842 A.D.). Located just east of Little Hagia Sophia in the Fatih-Küçük Ayasofya Quarter on the historical half of the Marmara Sea coast, this middle ninth century Byzantine period palace has survived to this day with only its remains. Called the Buccoleonis Majus Palatium in Latin, Boukoleon Palace was registered on Sept. 10, 1982 with the decision of the Supreme Council of Antiquities and Monuments. The Fatih Municipality was given was given permission for the survey, restitution, reconstruction, construction, electricity, machine projects and landscaping project of the palace, with the financing provided by the Istanbul Governor's Office Investment Monitoring and Coordination Department. After the restoration project, the palace will function as an open-air museum. The survey and restitution projects prepared by the Fatih Municipality were approved on June 27, 2018 dated decision of the Regional Directorate of Conversation. And the Boukoleon Palace Restoration Project was delivered to Istanbul 5th Regional Directorate of Cultural Heritage Conservation on July 25, 2018. 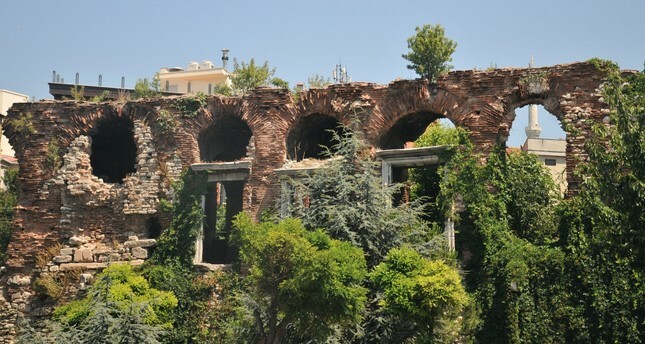 Restoration of the Byzantine Palace will be carried out by the Istanbul Metropolitan Municipality Directorate of Construction Affairs following the approval of the Restoration Project presented to the Istanbul 5th Regional Directorate of Cultural Heritage Conservation. In the Restoration Project proposed to the Conservation Board, the Boukoleon Palace will function as an Open-Air Museum. Within the scope of the restoration project report presented to the Conservation Board, cement-based mortar, filling material and joints, installation materials on the structure such as cables and pipes, iron joinery door, bars, adjoining walls and such will be removed and cleaned, while the trees, plantations and vines seen on the walls, floor and top of the building will be cleaned as described in the intervention orders. For the prevention of material and surface losses, it is has been proposed to strengthen and reinforce the structure with proper material by minimizing the intervention on the original texture of the structure. Accordingly, all subsequent ironworks will be removed. All marble surfaces will be cleaned. Structural elements and places with broken parts will be repaired. Sections with material loss will be completed. Repairs will be made where melting and wear are observed. The cement plastered rubble stone wall located between the Boukoleon Palace and the railway will be removed and replaced with a wrought iron fence. In order to ensure that visitors can walk safely without damaging the structure, a wooden walking path will be made. Meanwhile, sections with surface and material loss on the facades of the Faros Tower will be completed with cut stone in accordance with the original form by taking into account the static condition of the structure. The debris on the ground of Boukoleon Palace will be removed. The marble columns belonging to the original facade beneath the large arches under the Emperor's Pier will be unearthed by archaeological excavations in these sections. All subsequent manufacturing (such as wire fences, iron bars, sheet irons used to cover the gaps, et cetera.) will be removed. On the eastern front of the Emperor's Pier, a pool will be built at the specified location, scale and depth. In addition, a wooden bridge will be built at the entrance of the cistern. The park in front of Boukoleon Palace will be removed, and an underground museum structure will be built. In addition, environmental planning and stone pavements will be made for visitors to walk around the structure. The wire fences around the Boukoleon Palace will be removed and replaced with wrought iron fences. The marble block, on the front side of the main entrance door that features the monogram of Emperor Justinian, will be removed and be put back to its original place.